Unfortunately, injury in dance is common. There is a 75-97% annual incidence of in-jury among professional dancers. 80% of professional dancers will experience a major injury during their career. 45% of dancers ages 14-16 reported injury in one study. Fortunately, 98% of dance injuries are treated successfully with conservative measures. Injuries to the foot/ankle predominate. These are followed by injuries to the spine, hip, and knee, in that order. Most are repetitive stress injuries (RSIs), and respond to rela-tive rest and gentle, maintenance stretching. 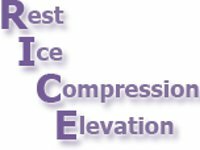 RICE (rest, ice, compression, elevation) remains the gold standard for acute injuries. The sports medicine field is undergoing some change when it comes to the use of medications such as Advil (ibuprofen), Al-leve (naprosyn) and other non-steroidal anti-inflammatory drugs (NSAIDs). There is a fear that prolonged use may impair healing, so the current recommendation is to limit NSAID use to 2-3 days. In general, if it hurts, rest it. If it swells ice and elevate. Swelling and/or bruising im-plies tissue damage and subsequent inflammation. Both should signal the dancer to reduce or eliminate weight bearing on the injured limb. Gentle stretching is encouraged, if tolerated. Injuries that are not improving at least 15-20% per week with appropriate conservative management should trigger medical attention. Injuries can affect flexibility and proprioception (the ability to feel the relative position of one's body in space), even after they have healed. This may lead to compensatory changes in technique that predispose to injuries elsewhere. It is critical that the post-injury rehabilitation process focuses on restoration of range-of-motion (ROM) and proprioception. Recurrent injury should trigger an in-depth look at the dancer's technique and anatomic alignment(s). A sudden, uncontrolled inversion at the foot (such as landing a jump) can lead to a sprain to the outside (lateral) aspect of the ankle. A sprain is an actual partial tear of the ligament(s) (that connect bones to each other), and frequently results in structural weakness and joint laxity even after healing. 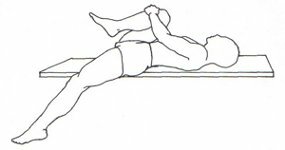 Rest, ice, elevate and gentle stretching (pulling the foot up towards the leg), and possibly no- or limited- weight bearing and/or splinting should be used initially. » Figure 1 Figure 1: Anterior talar sling taping. Avoid taping to restrict ROM in a dancer unless absolutely necessary. Lateral ankle sprains can sometimes be accompanied by a fracture of the foot portion of the smallest toe (5th metatarsal). If persistently painful in the outside foot, x-rays are required to guide management. Most fractures of this kind will be minimally displaced, and heal well with nonweight bearing and a cast for up to three months, although weight bearing may resume when the dancer is pain free (transition to an Aircast boot). A lateral ankle sprain can result in long-term decreased ankle movement and an impaired backwards glide of one of the ankle joint bones (the talus). Especially with the constant foot pointing activitiy in dance, athletic taping (see Figure 1) the front part of the ankle to promote backward talar glide is encouraged as the dancer gradually returns to weight-bearing and dance. Any injury to the inside of the ankle requires x-ray evaluation due to significant concerns of potentially complex fracture(s) that may require surgery. Tendonitis is a trap for athletes/dancers. A tendon connects a muscle to a bone, and it can become inflamed if repetitively stressed. The condition is usually more stiff and painful after periods of prolonged immobility, then will feel better once “warmed up”. Subsequent overdoing it will only exacerbate the condition. In dancers, tendonitis frequently involves the muscle that bends the big toe (flexor hallicus longus or FHL). This can be due to repetitive pliéàrelevé maneuvers where the tendon is overstretched in plié, then compressed between bony prominences in relevé. Tight ankles may contribute, even with walking, because the ankle rotates instead of bending and the FHL tendon may start catching and scraping. The tendonmay become swollen and be painful with plié. Treatment involves relative rest, stretching, massage, and correcting foot/ankle mechanics (orthotics, padding, stretching and directed strengthening). » Figure 2 Figure 2: Hip Anatomy. This is surprisingly common in dancers (13-27% of reported dancers) compared with other sports. There are three main causes: iliotibial band (ITB) tightness, iliopsoas (IP) tightness, and a hip joint labral tear. Both the ITB and IP are hip muscle groups whose tendons can catch and “snap” across a nearby bony prominence, creating a sensation of snapping and even an audible popping with hip movement (see Figure 2). These are typically annoying and worrisome, but are benign. ITB tightness can sometimes irritate an adjacent bursa (a lubricated pad for the tendon to slide across), leading to a tro-chanteric bursitis. The initial treatment for both is relative rest and diligent stretching of the tendons involved. 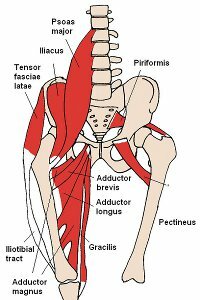 The ITB involves stretching both the tensor fascia lata and the gluteus maximus (see Figures 3-5). In stretching IP, it is important to stabilize the pelvis and lumbar spine. Recalcitrant trochanteric bursitis frequently responds well to a local cortisone injection. Hip joint labral tears are the new “in” diagnosis in Orthopoedics. A labrum is a cartilage cup in certain joints that helps keep that joint stable. Tears can sometimes lead to snapping, but rarely popping. Pain and a feeling of instability may occur. It is very possible that more of these are being diagnosed due to improved MRI technology, and many of these tears are not the cause of hip snapping. Unfortunately, medical science is still trying to determine what is normal and what is a tear warranting surgery. Numerous studies show that the less experienced dancer is more prone to injury. Studies looking at injured dancers find a correlation with incorrect alignment and/or improper technique. Research also points to a preponderance of injuries later in the season, or towards the ends of intense practice sessions. This means that the tired dancer gets hurt. Since most injuries in dance are due to repetitive stress, onset can be insidious. Warming up, warming down, good nutrition/rest, conditioning, and avoiding sudden, dramatic changes in the overall amount and intensity of dance training/performance are keys to avoiding injury.